You’ve probably heard that getting more antioxidants in your diet is good for your health. But antioxidants in your skin care? Take a closer look at the ingredient list in your quality skin care products these days and you’ll see them. Often skin care companies brag about them on the labels, letting you know that when you apply these creams and lotions to your skin, you’ll be getting antioxidants right along with them. But do they do you any good? Let’s look at what antioxidants are, and how they can help you enjoy more youthful looking skin. Antioxidants are vitamin-like compounds in plant-based foods and extracts that provide all sorts of health benefits. Their main action is to disarm free radicals so that they can’t damage cells, which protects you from all sorts of problems. We can’t really talk about antioxidants without explaining more completely exactly what a “free radical” is. You can think of them as byproducts of oxygen metabolism. As we take in and use oxygen, we naturally create free radicals as a sort of waste product. These free radicals can then damage cells, proteins, and DNA. A free radical is an unstable molecule with an odd number of electrons. Electrons like to travel in pairs, so when there is an odd number, the molecule searches around to resolve the situation by stealing an electron from another molecule. That victim molecule then becomes a free radical itself, and steals an electron from another molecule, setting up a domino effect. This dangerous chain reaction damages cellular components like DNA, cell membranes, and more, messing up our cells and even killing some off. Over time, if there are too many free radicals, they can cause damage leading to aging and a number of our common life-threatening diseases including cancer, heart disease, Alzheimer’s disease, vision loss, arthritis, and more. Free radicals are formed normally during metabolism, and can also form when we are exposed to air pollution, tobacco smoke, radiation, and toxins in the water we drink. The food we eat can also be a source of free-radical generating pesticides and chemicals. Normally the body can handle the free radicals. The immune system actually uses them to neutralize viruses and bacteria, so it’s important that we have some. It’s when we get too many that we have trouble. The optimal condition is to keep them in balance with antioxidants. These are the body’s neutralizing mechanisms that keep free radicals from getting out of hand. An antioxidant can actually donate an electron to a free radical, stabilizing it, without becoming a free radical itself. So it stops the chain reaction, and keeps any further damage from happening. Antioxidants act as scavengers inside us or on the skin, seeking out the free radicals and disarming them. You’ve heard that you should eat more fruits and vegetables. These foods are rich in antioxidants that can help neutralize excess free radicals in your body, and help increase your odds of avoiding disease. Antioxidants exist in tea, wine, and chocolate too, and there are all different kinds of them. Though scientists aren’t sure how these many antioxidants differ from one another, they do know that some vitamins like vitamin C, E, and A act as antioxidants, but so do other compounds called “flavonoids” that exist in plants, like resveratrol and lycopene. You’ve heard of the word “superfood.” Typically these are foods that are high in nutrients, including antioxidants. We know, for example, that berries (like blueberries and goji berries) are high in antioxidants, which is why they’re often referred to as “superfoods.” Dark chocolate, pecans, beans, sweet potatoes, tea, and artichokes are also all great sources of antioxidants. Adding these items to your daily diet can help you keep your free radicals in check, which may lead to a healthier life. Just as antioxidants neutralize free radicals in the body, they can also neutralize them in your skin. Remember that skin is the largest organ in your body, and needs the same cellular protection as your other organs. On top of that, the skin is even more exposed to pollution, tobacco smoke, UV radiation, and other environmental factors that encourage the formation of free radicals, which leaves it even more vulnerable to the damage these unstable molecules can cause. In a 2012 study, researchers noted that human skin is constantly exposed to the air, solar radiation, environmental pollutants, and other chemical insults, “which are capable of inducing the generation of free radicals” that can cause damage. The only protection for skin, the researchers continued, comes from its own pigment (melanin), and from antioxidants we consume from food. Researchers agreed in another 2012 study, noting that “the most important source of antioxidants” for delaying skin aging is through nutrition. This is why it’s important not only for your overall health, but your skin, to eat more fruits and vegetables! We can also apply antioxidants topically to help protect the skin. Studies show that using antioxidants in our skin creams and serums can help reduce the degradation of collagen, neutralize free radicals, and help keep skin looking more healthy and youthful. 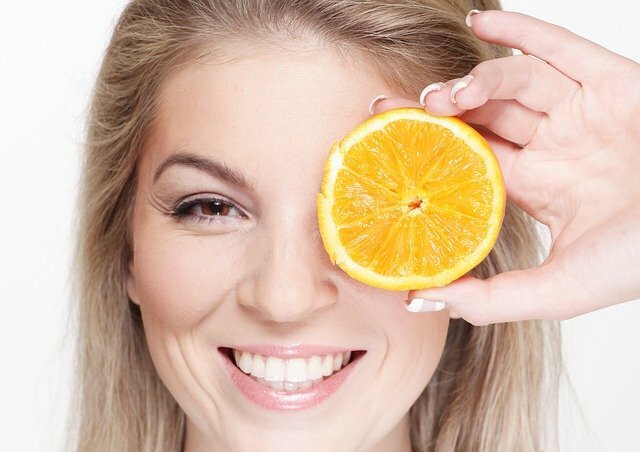 Some key antioxidants that have been found to work in skin care include vitamin C, B3 (niacin), and E, because they can all penetrate the skin easily. Studies have also shown that the antioxidant protection is higher when antioxidants are combined, as they have a way of working together. Vitamin C and E make good partners, for example, creating a higher protection against free radicals than either one working along. In clinical trails, applying creams with vitamins C and E and niacin produced improvements in skin elasticity, pigmentations, and inflammation. Other antioxidants have been found to help produce collagen and elastin, which keep skin taught. These include vitamin A and other plant-based antioxidants. Perhaps most importantly, antioxidants protect the skin from the sun, which is the number-one cause of fine lines and wrinkles, hyperpigmentation, and other signs of premature aging. In a 2013 study, researchers reported that antioxidants helped prevent skin damage from ultraviolet rays, and a more recent study found that antioxidant-based topical formulations helped quench inflammation in the skin. A number of polyphenols, or plant-based compounds, have also shown strong antioxidant activity, and can be very useful in skincare products. You’ll find them in things like turmeric root and ginger extract, as well as in oils like olive, jojoba, sunflower, and more. Do you look for antioxidants in your skin care? SourcesBorut Poljsak and Raja Dahmane, “Free Radicals and Extrinsic Skin Aging,” Dermatol Res Pract., 2012; https://www.ncbi.nlm.nih.gov/pmc/articles/PMC3299230/.Ruta Ganceviciene, et al., “Skin anti-aging strategies,” Dermatoendocrinol., July 1, 2012; 4(3):308-319, https://www.ncbi.nlm.nih.gov/pmc/articles/PMC3583892/.Ruza Pandel, et al., “Skin Photoaging and the Role of Antioxidants in Its Prevention,” ISRN Dermatology, 2013; https://www.hindawi.com/journals/isrn/2013/930164/.Tais A. L. Wagemaker, et al., “Antioxidant-based topical formulations influence on the inflammatory response of Japanese skin: A clinical study using non-invasive techniques,” European Journal of Pharmaceutics and Biopharmaceutics, August 2017; 117:195-202, http://www.sciencedirect.com/science/article/pii/S0939641117301637.